Use this list of consonant, vowel, consonant words to plan a lesson or project for your beginning readers. What tool does a farmer use? Children put their reasoning skills to the test as they match workers to tools in this fun worksheet. Help kids express themselves through writing with this blank journal page. Help your first grader learn about words that end in y and the different sounds they make. Ready, set, spell! Use this worksheet to gauge your students’ familiarity with common year three spelling patterns. Help your year one student practise their beginning reading skills by making their very own CVC (consonant-vowel-consonant) words in this fun worksheet focusing on short a words. Assess your students’ ability to write sentences using this fun writing assessment. 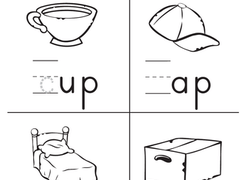 Test your new reader's grasp of beginning and ending consonant sounds with this phonics quiz. Children use their critical thinking skills and knowledge of community helpers to select the odd picture out. Although y is a consonant, once in a while it behaves like a vowel. Help your beginning reader practise sounding out a few of these tricky words. 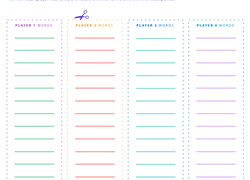 Kindergarteners can play their way to reading mastery with this printable board game that offers practise in reading and phonics, vocabulary, and word building! Get your students excited about reading and all the words they know with this sight word worksheet. As they keep an eye out for sight words, they will also get faster at reading them! Children colour in the objects a police officer uses in the line of duty, then label them using a word bank. Search the picture for the community helpers and their equipment. colour them in when you find them! Use the word bank to fill in the community helper sentences, then match the completed sentence to the correct picture. What tool does a mechanic use? Children put their reasoning skills to the test as they match workers to tools in this fun worksheet. As students begin the task of writing their narratives, this fun worksheet encourages them to remember to spell these common sight words correctly. If your first grader needs help learning the short o sound, try this worksheet. She'll figure out which pictures feature the short o sound. Help your kindergarteners practise their beginning reading skills by making their very own CVC (consonant-vowel-consonant) short E words. It's a bird! It's a plane! No, it's the alphabet! Have your students to practise identifying and writing letters in the alphabet with this fun missing letters worksheet. 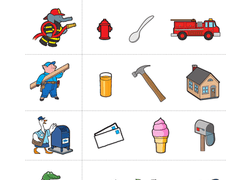 Find the community helpers and the equipment they use on the job in this word search.